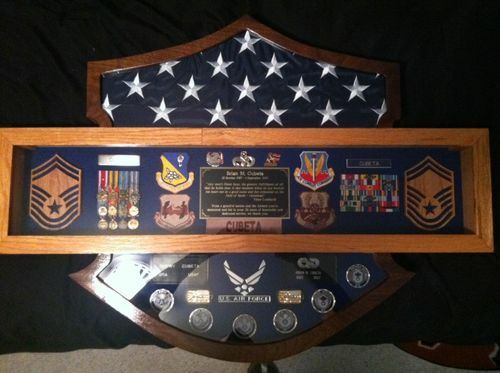 A friend is retiring from the Air Force and wanted to know if I could make a shadowbox in the shape the Harley Davidson shield. I waited about a month before I agreed to tackle it. It is made of maple, with orange and black Transtint dye and black felt background. It was my first time using Transtint so I had several trial and error test pieces to get the right color. I think it turned out alright and he seemed very happy. The top and bottom of the face are a solid piece cut on a scroll saw and screwed to the middle section. If I make another I will make the front frame pieces a little wider. It almost didn’t hide the box behind it. The glass was cut in three pieces and installed in the back of the face frame. I built a simple stand for it because he doesn’t want to hang it, but forgot to take a picture. Hope ya’ll like it. I’m about to retire from the Air Force too! Congratulate him, and thank him for his service. You did a great job, I’m sure he will love it! Very cool I have a friend that would love one of these thanks for sharing! @Trey- Congrats on your retirement! Way cool shadow box, like the design and colors. Very sleek project that I’m sure your friend loves. Great job!